In 1956, Vertol began preliminary design and engineering of a twin-turbine transport helicopter for commercial and military applications. The main objective was to take full advantage of the high power, small size and light weight of the shaft-turbine engines then becoming available. To achieve the best possible hovering performance, the traditional Vertol tandem-rotor layout was retained, and the turbines were mounted above the rear of the cabin, on each side of the aft rotor pylon. This results in maximum unobstructed cabin area and permits the use of a large rear ramp for straight-in loading of vehicles and bulky freight. Construction of a prototype, designated Model 107, was started in May 1957, and this aircraft flew for the first time on 22 April 1958, powered by two 641kW Lycoming T53 turboshaft engines. It was designed for water landing capability, without the addition of special flotation gear or boat hull design, and was intended to carry 23 to 25 passengers in normal airline standard accommodation. The new Model 107 prototype with two 877shp Lycoming T53 turbines flew on 12 August 1958. In July 1958, the US Army ordered 10 Model 107s, designated YHC-1A; seven with the uprated 1065shp General Electric YT58 turbine and three with the Lycoming T53, and a rotor diameter increased by 0.6m. The first YHC-1A flew on 27 August 1959, but in the meantime, the US Army had ordered five YHC-1Bs (Model 114 later known as the CH-47 Chinook), a scaled-up variant which was better suited to meet its need for a tactical transport helicopter, and consequently the order for the Model 107 was reduced to only three machines (serials 58-5514 through -5516). These machines were used primarily to familiarize Army flight crews with the capabilities of turbine-powered helicopters, and all three were eventually returned to the manufacturer. The third of these was later returned to the company which equipped it with 783kW General Electric T58-GE-6 turboshaft engines and rotors of increased diameter, and this derivative was fitted out with a commercial interior as the Model 107-II prototype. This first flew on 25 October 1960. By that time Vertol had become a division of The Boeing Company. The first production model of the airliner spec 107 II followed on 19 May 1961 and FAA certification was received on 26 January 1962, entering scheduled service with New York Airways 1 July that year. Eight helicopters were delivered and began scheduled services between mid town Manhatten and Kennedy and La Guardia aoirports. Following this initial order remaining commercial variants were built by Kawasaki. When the US Navy set up a new design competition for a medium-lift transport helicopter in 1960, this was won by the Boeing-Vertol 107M, a modified version of the YHC-1A powered by T58-GE-8 engines in February 1961. A batch of 50 was initially ordered, the first of which was tested in October 1962. Ordered into production under the designation HRB-1 (changed to CH-46A Sea Knight in 1962), the 107M was used for troop transport. The first order for the CH-46A assault transport version for the US Marine Corps was placed in February 1991, with first flight on 16 October 1962. This basic model accommodates a typical total of 26 troops or 15 casualty litters. Testing continued into late 1964, with the first US Marine squadrons taking these aircraft into service in early 1965. Four squadrons were operating CH-46As by June 1965 and the type entered service in Vietnam in March 1966, replacing the Sikorsky H-34.During the V ietnam War the Marines also installed a 7.62mm machine gun, which was fired through the cabin door. A total of 498 have been ordered by the Marine Corps and 24 by the US Navy. Several variants have been produced including the CH-46A for the Marines (160); the UH-46A Sea Knight for the US Navy (24) with first deliveries to Utility Helicopter Squadron 1 in July 1964) the CH-46D for the USMC, generally similar to the CH-46A, but with 1044kW T58-GE-10 turboshaft engines (266); the UH-46D for the US Navy (10); the UH-46B for evaluation by the USAF; the RH-46E minehunters for the US Navy, and the CH-46F for the Marines , generally similar to the CH-46D, but with additional avionics (174). The US Navy UH-46 model accommodated a typical total of 26 troops or 15 casualty litters but also able to carry 3175 kg (7,000 lb) of cargo, including vehicles loaded through the full-section rear ramp door, for use in the vertrep (vertical replenishment) of ships at sea. Both Sea Knight families can have rescue hoists and are equip-ped for limited amphibious operation, though they are not intended for sus-tained alighting on rough seas. Some 669 Sea Knights were built; US Navy and Marine Corps models serving in Operation Desert Storm. A total of 624 models were delivered by 1971, and most surviv-ing examples have been subjected to major update programmes which include fitting glassfibre rotor blades. The best 273 Sea Knights in US Marine Corps service were progressively being rebuilt as CH-46E helicopters with the more powerful 1394kW General Electric T58-GE-16 turboshaft engines, replacing the 1,250- or 1,400-shp (932- or 1044-kW) T58 engines origi-nally fitted, as well as numerous im-provements to improve reliability, res-cue capability and ability to survive a crash on land or on water. Since 1981, 368 kits were supplied to provide further modifications to improve safety and reduce costs. The CH/UH-46 carries a crew of three, 25 troops and troop commander. Door at front of troop compartment on starboard side. Door is split type; upper half rolls on tracks to stowed position in fuselage crown, lower half is hinged at the bottom and opens outward, with built-in steps. Loading ramp and hatch at rear of fuselage can be opened in flight or on the water. Floor has centre panel stressed for 1,464kg/sq.m. A row of rollers on each side for handling standard military pallets or wire baskets. Outer portion of floor is vehicle treadway stressed for 454kg rubber-tyred wheel loads. Cargo and personnel hoist system includes a variable-speed winch capable of 907kg cable pull at 9m/min for cargo loading or 272kg cable pull at 30m/min for personnel hoisting; it can be operated by one man. A 4,535kg capacity hook for external loads is installed in a cargo hatch in the floor. The cabin is heated by a Janitrol combustion heater and hydraulic system provides 105kg/sq.cm pressure for flying control boost, 210kg/sq.cm for other services. Electrical system includes two 40kVA AC generators and a Leland 200A DC generator. Solar APU provides power for starting and systems check-out. CH-46 has dual stability augmentation systems and automatic trim system. Featuring two three-blade rotors in tandem, rotating in opposite directions. The CH/UH-46 has power-operated blade folding. Power is transmitted from each engine through individually overrunning clutches into the aft transmission, which combines the engine outputs, thereby providing a single power output to the interconnecting shaft which enables both rotors to be driven by either engine. The structure is square-section stressed-skin semi-monocoque structure built primarily of high-strength bare and alclad aluminium alloy. Transverse bulkheads and built-up frames support transmission, power plant and landing gear. Loading ramp forms undersurface of upswept rear fuselage on utility and military models. Baggage container replaces ramp on airliner version. Fuselage is sealed to permit operation from water. Non-retractable tricycle landing gear has twin-wheels on all three units. Oleo-pneumatic shock-absorbers manufactured by Loud (main gear) and Jarry (nose gear). Goodyear tubeless tyres size 8 x 5.5, pressure 10.55kg/sq.cm, on all wheels. Goodyear disc brakes. Six utility models, almost identical to the CH-46A, were delivered to the RCAF in 1963-4 under the designation CH-113 Labrador, and 12 similar aircraft were built for the Canadian Army during 1964-5, these being designated CH-113A Voyageur. The CH-113 Labrador had a range of over 650 miles (1,050 km). Under a Canadian Armed Forces' Search And Rescue Capability Upgrade Project (SARCUP), Boeing of Canada was contracted to modify six CH-113s and five CH-113As to an improved SAR standard by mid-1984, with extra fuel, weather radar, a water dam for use of the rear ramp at sea and an APU (auxiliary power unit). In 1962-3 Boeing Vertol supplied 14 Model 107-IIs to Sweden for service with the air force in the search and rescue role, and with the navy for ASW and minesweeping duties: both of these versions have the designation HKP-4. Sweden uses the Gnome-engined HKP-7 version for ASW and mines-weeping duties. Kawasaki Heavy Industries obtained a licence in December 1965 to build the Model 107 in Japan in civil and military versions re-sulting in 12 new versions: the KV-107/11-2 commercial version for passenger transport adopted by Kawasaki, the Thai government and New York Airways; the KV-107/11-3 minehunters; the KV-107/11-4 for tactical transport, 59 of which have been built for the Japanese Ground Self-Defense Force; the KV-107/11-5 rescue version for the Japanese Air Self-Defense Force and the Swedish Navy (38 built); the KV-107/11-7 six-eleven-seat VIP transport version, only one of which has been built for the Thai government; and the KV-107/IIA version for hot climates and high altitudes. Kawasaki obtained in 1965 exclusive rights to manufacture this tandem rotor helicopter and sell it worldwide. The first KV107II obtained Japanese and US type approval in Spring 1968. The 107 Model II standard accommodation is for two pilots, stewardess and 25 passengers in airliner. Seats in eight rows, in pairs on port side and single seats on starboard side (two pairs at rear of cabin) with central aisle. Airliner fitted with parcel rack and a roll-out baggage container, with capacity of approximately 680kg, located in underside of rear fuselage. Ramp of utility model is power-operated on the ground or in flight and can be removed or left open to permit carriage of extra long cargo. The naval KV-107II-3 is a specialized MCM (mine countermeasures) helicopter, of which nine serve with the JMSDF's 111th Air Wing. This version has up-rated engines (1,400 shp/1044 kW) in-stead of 1, 50 shp/932 kW) and com-prehensive equipment for mine-sweeping and retrieval, as well as long-range tanks, cargo hook and towing gear. 107 Model II: Standard commercial version, with two 932kW (1,250 shp) General Electric CT58 turboshaft. Available as an airliner with roll-out rear baggage container or utility model with rear-loading ramp. CH-46A (formerly HRB-1) Sea Knight: US Marine Corps assault transport version of the 107 Model II powered by two 932kW General Electric T58-GE-8B turboshafts. CH-46D Sea Knight: Generally similar to CH-46A, but with 1,044kW General Electric T58-GE-10 turboshaft and cambered rotor blades. CH-46E Sea Knight: Upgraded CH-46A with 1,394kW General Electric T58-GE-16 turboshafts and other modifications including provision of crash attenuating seats for pilot and co-pilot, a crash and combat resistant fuel system and improved rescue system. Initial fleet modifications began in 1977, and the first CH-46E modified at Cherry Point NV, Naval Rework Facility was rolled out 3 August 1977. CH-46F Sea Knight: Generally similar to CH-46D, with the same engines and rotor blades. Contains additional electronics equipment. All CH-46s delivered since July 1968 were of this version. UH-46A Sea Knight: Similar to CH-46A. Ordered by US Navy for operation from AFS or AOE combat supply ships to transport supplies, ammunition and missiles as well as aviation spares to combatant vessels under way at sea. Secondary tasks include transfer of personnel and SAR. First deliveries in July 1964. UH-46D Sea Knight: Generally similar to UH-46A, but with 1,044kW General Electric T58-GE-10 shaft turbine engines and cambered rotor blades. UH-46s delivered since September 1966 were of this version. CH-113 Labrador: Six utility models delivered to RCAF in 1963-64 for SAR duties. Generally similar to CH-46A. Two 932kW General Electric T58-GE-8B turboshafts. Larger capacity fuel tanks (total 3,408 litres) giving a range of over 1,050km. All six upgraded under Search and Rescue Capability Upgrading Programme (SARCUP). CH-113A Voyageur: Twelve aircraft in a similar configuration to that of CH-46A, delivered to Canadian Army in 1964-65 as troop and cargo carriers in logistical and tactical missions. Eight upgraded to SARCUP configuration. Hkp 4C: Built for Royal Swedish Navy (45) and Air Force (10) in 1962-63, with Bristol Siddeley Gnome H.1200 turboshaft engines and fuel tanks of 3,786 litres capacity. Naval version has equipment for anti-submarine and mine countermeasures operations. Since upgraded with Gnome H.1400 turboshafts and new avionics. 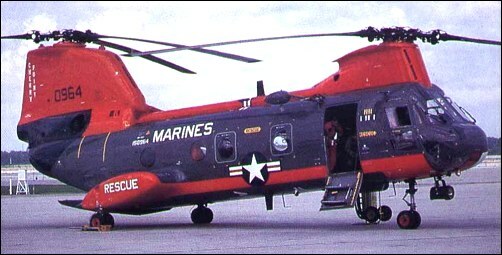 HH-46D: Rescue version in service with the US Navy. UH-46D: Base utility and rescue helicopter. In service with the US Navy. accommo-dates 26 troops or 15 casualty litters. Engines: two 1,870-shp (1394-kW) General Electric T58-16 turboshafts.